The second annual Eagle Honors Dinner will be March 23, 2019 at Rockville Bible Church at 6:00 pm. The purpose is to recognize and honor all Scouts in our District who earned their Eagle Scout rank in 2018 or 2019 to date. 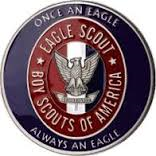 Those new Eagle Scouts will receive a complimentary dinner. The cost for adults is $15, and $7 for children under 10. RSVP to Jim or Christine Patchen (707-864-6656) by March 3. This entry was posted in Events on February 4, 2019 by Sue.